PROVIDENCE, RI — North Attleboro erased an eight point deficit over the final three minutes of the fourth quarter, but left just enough time left on the clock for Milford senior Zack Tamagni. After two free throws with 5.7 seconds from North Attleboro senior Brent Doherty tied the game, Tamagni took the inbound pass, broke through a pair of defenders at the three point line and then danced his way past the last defender, laying it up with his left and in off the glass as time expired to give the Scarlet Hawks a 57-55 win. Milford had the original comeback of the game, cutting an 11-point deficit at halftime (35-24) down to just one (41-40) entering the final quarter by outscoring the Rocketeers 16-6 in the third quarter. The Hawks carried that momentum into the fourth quarter with Nate Davila (14 points) draining an early three to give Milford its first lead since the first quarter. North’s Jonny Friberg (nine points, 13 rebounds, six assists) responded right away to tie the game at 43, but Milford would create separation with an 8-0 run over the next four minutes. Tamagni (17 points, four assists) hit two free throws, Ryan Sullivan (10 points, five rebounds) hit one and then three possessions later, Arcudi converted a putback with four minutes to play. Kayden Kelley (12 points, 13 rebounds) came up with a block on the defensive end and then converted a three-point play to put Milford up 51-43 with just over three minutes to play. That’s when North Attleboro took its turn crafting a comeback. It started with a strong take from Thomas Reynolds (10 points, three boards, two assists) off a feed from Friberg and then was cut to five when Reynolds hit a free throw. The Rocketeers then forced a turnover, resulting in Reynolds finding Doherty (game-high 18 points) for a three to bring North within two. Tamagni (38 seconds left) and Friberg (22 seconds left) then each hit a pair of free throws to keep Milford’s two point lead. Tamagni then hit two more but Hacmoni Cuevas converted a putback, plus the harm, to get within two. North corralled the missed three throw and Doherty was fouled with 5.7 seconds left, converting both at the line to tie the game before Tamagni’s heroics. “We told him to go to the hoop,” Seaver said of the last play. “It was something we tried to do on Friday to tie the game and things didn’t go our way. We were able to get it today. North Attleboro came out on fire to start the game, going 7/12 from the field in the first quarter to build a 19-13 lead. Milford was efficient as well, going 5/7 and a perfect 3/3 from deep but had seven turnovers. “They came out like we did here last year,” Seaver said. “We were on the other side of it this time, it is what it is. We just trusted our defense and in the end, I guess we got one more stop, or just made one more play at the end. The Rocketeers’ offense continued its strong start by going 6/9 from the field in the second. At halftime, North Attleboro was 6/10 from deep. But in the second half, Big Red managed just one three on 10 attempts. Milford takes over the top spot in the Davenport division with the win, moving to 8-6 overall and 6-4 in league play. 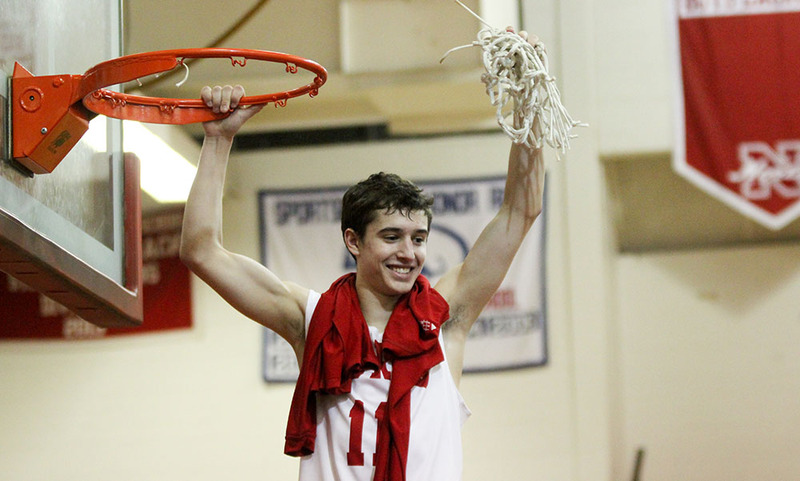 The Scarlet Hawks will try to extended their division lead on Tuesday when Mansfield comes to town. North Attleboro (8-6 overall, 5-5 Hockomock) looks to get back into the win column when it hosts King Philip on the same night. 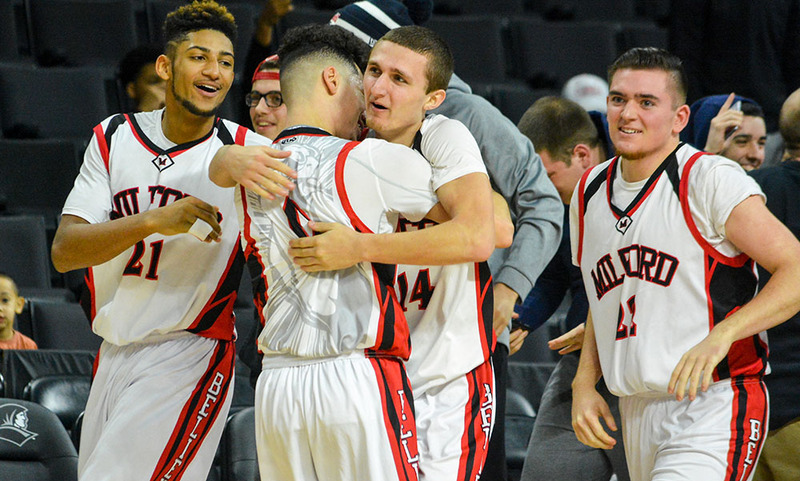 PROVIDENCE, R.I. – For the third straight game, Milford was on fire from downtown. For the third straight game, the Scarlet Hawks made double-digit threes and their hot shooting helped pick up a 75-63 win over North Attleboro to pick up consecutive wins for the first time since 2013. 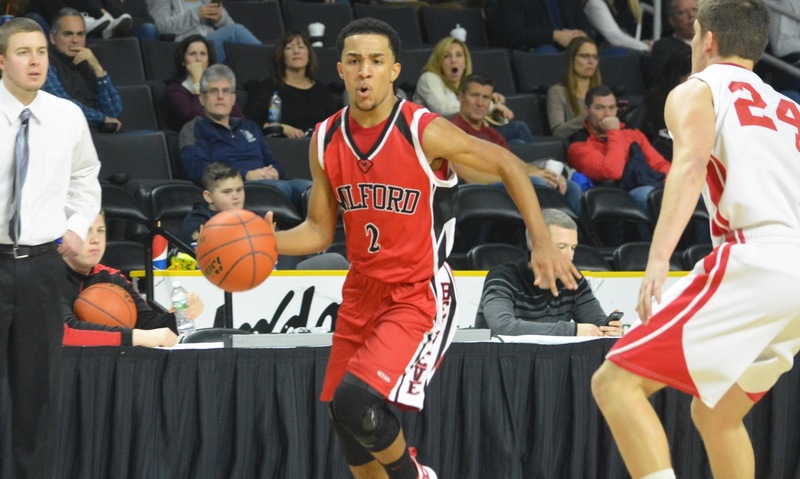 Milford opened the game with a pair of three pointers from Dimitry Torres but really opened things up over the last four and a half minutes of the first quarter. With the game tied 7-7, the Scarlet Hawks rattled off a 15-0 run over the next three minutes, suddenly building a 22-7 lead. Sophomore Kayden Kelley was responsible for eight of the points in the run and junior Zack Tamagni handled the other seven, including Milford’s third three of the quarter, to create a big lead. Brent Doherty and Chad Peterson stole a little momentum back with a three each just before the end of the quarter. But the momentum quickly swung back in favor of the Scarlet Hawks. Over the first four plus minutes of the second quarter, a 12-4 run capped by a three from Torres. A three from Nate Davila was followed by a layup and a free throw from Dwight Anderson. Josh Andonian drained a corner three before Torres’ capping shot from downtown. The Scarlet Hawks finished with 12 three pointers for the second straight game (hitting the same mark in a 68-50 win over Canton on Friday) and hitting 10 against Franklin this past Tuesday. North finished with a 6-2 run to conclude the first half to cut the deficit to 12 at halftime, trailing 36-24. Milford again continued its hot streak, starting the third quarter with a 9-2 run to creates its largest lead of the game at that point. Tamagni and Kelley each had a basket while Torres his a three and and went to the hoop for two more to put Milford up 45-26. The Rocketeers showed some fight one the final three minutes with a run of their own. A put back from Mario Bresko and a layup was sandwiched around a three from Brent Doherty Two more from Bresko cut the lead back to 12. Milford called a timeout and out of it, an offensive foul on Big Red turned into a three from Andonian and with the clock ticking away the final seconds of the third, Alex Macek pulled up for another three to make it 53-35 after three. Doherty scored nine of his game-high 21 points in the final quarter and Bresko added 10 of his 17 points in the final frame but the deficit proved to be too much. Milford added a trio of threes in the final quarter as well. 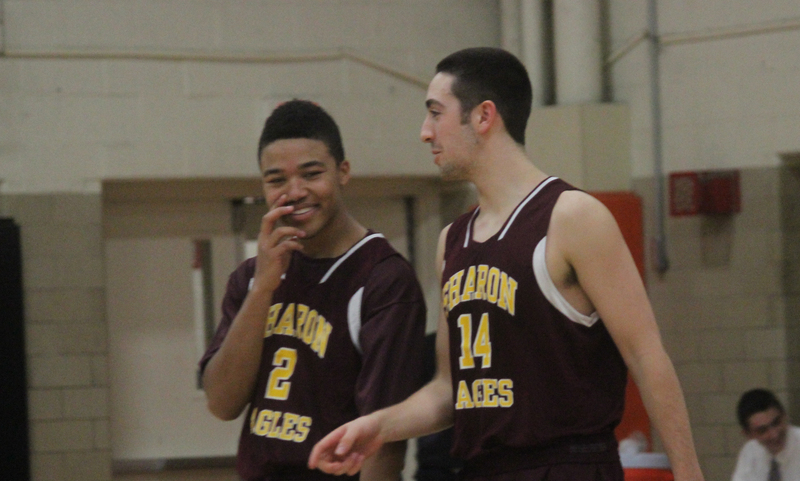 Over the final three periods, Milford had just a three point advantage. But a nine point lead after the first quarter proved to be the key to the separation. North Attleboro had been averaging over 60 points a game but through three quarters was stuck at 35 points, which can be credited to Milford’s press and zone defense. It was only after a 28 point fourth quarter they were able to get the offense in gear. Defensively, the Rocketeers entered allowing just 58 points per game. Milford’s 75 points was the most allowed all season. “The biggest disappointment was in our defensive effort,” Mulkerrins said. “You just can’t give up 75 points. The threes I think started us to break some of our rules. The kids would worry about the threes then we’re not in help position, then we’re late there and they can kick it out. It all just spiraled from there. Kayden Kelley finished with a career-high 16 points and added eight rebounds, Torres added 16 points, Andonian had a career-high 11 points and Tamagni had 10 points. Doherty had five rebounds and five assists along with his 21 points and Bresko added three rebounds with his 17 points. Junior Jonny Friberg had nine points and four rebounds. Milford (5-8, 4-7) will be back in action on Tuesday when they take on Mansfield in the second game of a doubleheader, slated for 6:45. North Attleboro (5-8, 4-7) will try to snap its current four game skid when they travel to Stoughton on Tuesday night at 6:30.